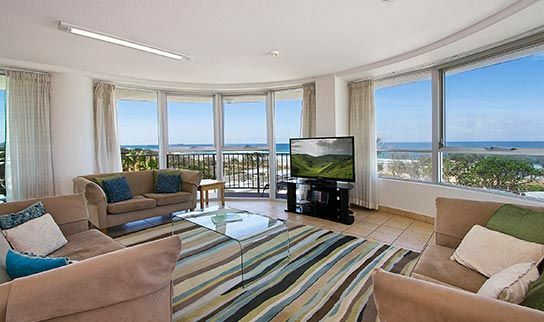 Chateau Royale Beach Resort offers 4 star self catering Maroochydore accommodation in Cotton Tree, Maroochydore. We are perfectly positioned in the heart of Queensland's beautiful Sunshine Coast only 20 metres from the magnificent patrolled golden surf beach in Maroochydore. All of Chateau Royale's luxury Maroochydore holiday apartments boast north-east facing spacious balconies and open plan living apartments where you will enjoying all day winter sun and cool sea breezes during the summer months, making this Maroochydore holiday accommodation a popular choice for vacations in the Cotton Tree area of Maroochydore. Chateau Royale Resort Accommodation offer spacious fully self contained 2 and 3 bedroom Sunshine Coast Holiday Apartments and Beach Houses. 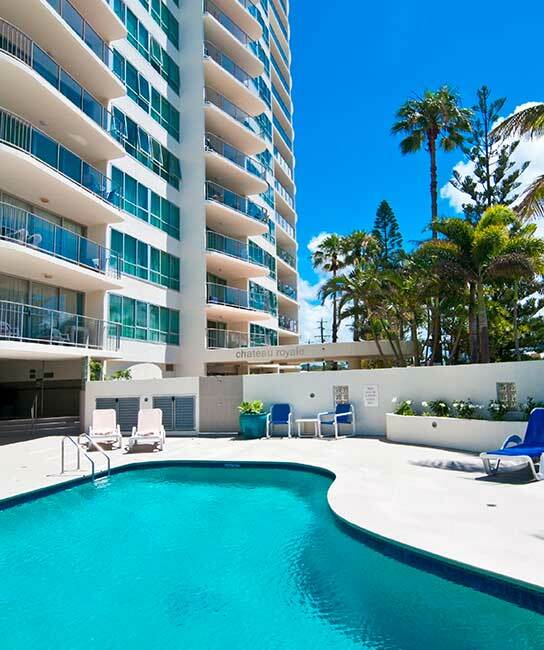 Each apartment has it's own large private balcony to allow you to relax and enjoy the best ocean, river and hinterland views on the Sunshine Coast from Mooloolaba to Noosa! Our Maroochydore holiday accommodation on the Sunshine Coast features an outdoor BBQ area, internet cafe, heated pool, spa, and sauna and steam room for those of you who enjoy the ultimate relaxation on your beachside holiday. There's an endless amount of fun to be had! For something a bit different, why not try one of Chateau Royale's fully self-contained beach house holiday accommodation. Each beach house holiday apartment is set over a relaxed multi-level format located directly opposite Maroochydore Beach. Chateau Royale's Maroochydore holiday accommodation is conveniently located at the Cotton Tree end of Maroochydore on the Sunshine Coast and is within an easy walk to boutique shops, cafes, restaurants and the Sunshine Coast's largest shopping centre, Sunshine Plaza, but yet far enough away from the hustle and bustle for that tranquil holiday experience on Queensland's beautiful Sunshine Coast. We stayed here for a weekend getaway from Coolum. AMAZING! Clean, fresh rooms. Wonderful outlook! Sandy, Simon & Jaimee-lee are wonderful down to earth. This place ticks all the boxes with a fabulous position, proximity to beaches and everything is a stone throw away, so you can park the car in the basement and explore by foot. Spectacular views, big air conditioned units and very friendly and helpful managers. Will return for sure. Most of the apartments in this building have a Million Dollar View of the ocean and river. Great location, fantastic views of river and ocean, very comfortable spacious units. Chateau Royale remains simply the best with views stretching up the coast and wonderful sea breezes. The Resort exceeded our expectations. Will never forget our rooms were amazing, our views breath-taking and all round service second to none. The units are spacious with great views. The management is focused on making your stay as enjoyable as possible. Excellent location, within walking distance to shops and amenities, great bus service across the road.